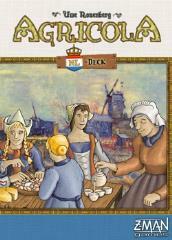 The NL-Deck for Agricola is a new set of cards for Uwe Rosenberg’s boardgame hit. The 60 Minor Improvements and 60 Occupations can be played as a stand-alone deck or shuffled into other decks. Play Agricola with a new thematic setting! Discover the Netherlands - a small country with more than just the stereotypical windmills, cheese and tulips.